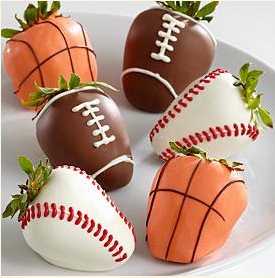 Once upon a time, in the wonderful land of online shopping, I came across these adorable sports themed chocolate covered strawberries. I knew my Prince (aka Bryce) would love these. Sports and chocolate all in one, it was perfect for his royal dessert! 6 berries would cost $25 plus shipping to Hawaii, that's more than a new pair of glass slippers! This princess knew she could make them herself, when the right time came along. Ok, ok, enough with the fairy tale! 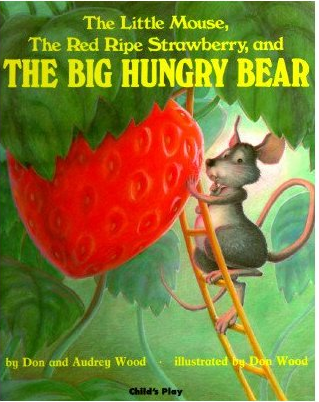 The reason for the story book theme is because, as a child, one of my favorite books was this: The Little Mouse, The Red Ripe Strawberry, and THE BIG HUNGRY BEAR. Long story short, the mouse tries several ways to protect the strawberry from THE BIG HUNGRY BEAR, but in the end he realizes the only way to keep it safe is to eat it himself, then live happily ever after! I love this book. So, Valentine's Day rolled around and we decided to cook at home this year since Prince Charming himself is still reminding me how much we spent at Chef Mavro over Christmas! I knew this would be the perfect opportunity to make these adorable sports themed desserts. Not just any ordinary strawberries would do so I went to the food mecca - Whole Foods. There I found a package of 18 long stemmed and huge strawberries for $12.99. Normally I'd settle for the cheaper berry or fruit (or junk food instead) but this was exactly what I needed and the price was a bargain in comparison to the $25 + shipping for 6 berries. These were worth it, just look at the beauties, the little mouse would eat himself to death! Equipped with my chocolate melter (Thanks, Mom! ), both milk and white chocolates, and white and red decorating gel I was ready. No basketballs here - Bryce is a baseball fanatic first, football fan second, I'd say maybe even hockey and golf appear on our TV more often than basketball. Then did the same with the white chocolate - which really isn't chocolate at all! I put them in the fridge for a while to firm up, then got to decorating! You'll see that some of the berries on the far right were my "starters" and not the prettiest... I mean most MASCULINE! Making them was a lot of fun and much less stressful than baking! I suppose the fruit part of the dessert is good, too. Here are the best ones ready for the BIG GAME! Somebody send this in to Sports Center! They were delicious. Bryce loved them, despite not being surprised. Try to hide a project like this from someone who you share a home and a fridge with! His favorite are the milk chocolate footballs and he was kind enough to share. It turns out my favorite are the white chocolate baseballs so we're set! And kicking a football! Isn't Valentine's Day fun?! What a great Valentine treat. Wonderful job. I remember that you liked the books about the Red Ripe Strawberry. Loved the book, and loved reading it to you...must have done that a million times!!! And really loved seeing the beautiful choc covered strawberries!!! Mama's proud!!! Thanks, Mom! You should have known this food obsession was progressing with my choice of book :) If I end up weighing 500 pounds some day it will be all your fault!